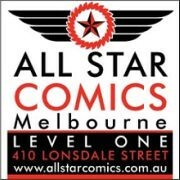 The world of action figures keeps getting closer and closer to the world of video games, and we here at Collector-ActionFigures.com are well aware of that fact. So to honor this week’s Halo 4 release, we’ve decided to partner up with McFarlane Toys to give away a great Halo 4 action figures prize pack. In fact, we’re giving away a prize pack including four different figures including Master Chief, Elite Zealot, Storm Grunt, and Spartan Warrior. For your chance to win these cool figures, you’ll need to complete a free membership registration with Collector-ActionFigures. It takes less a minute to register all the way through email verification, and it’s totally free. Not only will you be entered to win a great prize pack, you’ll also join one of the internet’s best (and growing) action figure communities, and gain access to the world’s most expansive action figure catalog and marketplace. 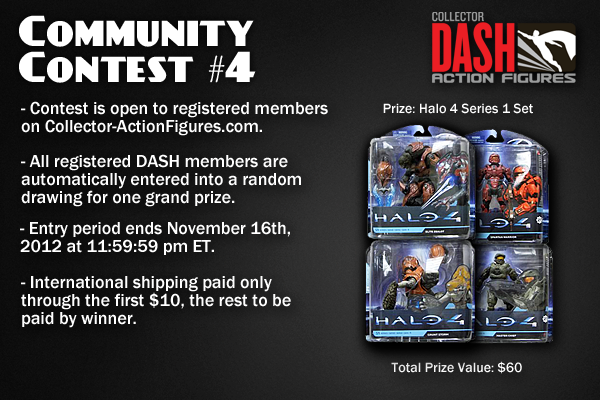 Start your collection on DASH today, and you might just win four new figures to make it stand out from the horde. So welcome to DASH, good luck with the contest, and more than anything else enjoy your time on Collector-ActionFigures.com. All entries must be received by 11:59p.m. ET on Friday November 16th, 2012. For an international winner, the first $10 will be paid for shipping, and the rest will be paid by the contestant.